Why is GAMP 5 Adherence so Important & what is the Impact? Why is GAMP 5 Adherence Important…? First, let’s take a brief look at what GAMP 5 is and how it can benefit your company. GAMP is an acronym for Good Automated Manufacturing Practice, (which is hopefully quite familiar to you), for a risk-based approach to computer system validation where a system is evaluated and assigned to a predefined category based on its intended use and complexity. Categorizing the system helps guide the efficient writing of system documentation (including specifications and test scripts and everything in between). Per Chrysa Plagiannos from Montrium, and the International Society for Pharmaceutical Engineering (ISPE) document titled “GAMP 5: A Risk-Based Approach to Compliant GxP Computerized Systems”, GAMP 5’s approach can be summed up by the V model diagram. Let’s look at what GAMP 5 means, and what differentiates this guideline from other standards and regulations. The V model juxtaposes the specifications produced for a system to the testing performed as part of the verification process. Specifications and design down the left side of the V and verification and validation up the right side. Traceability across the V results in tracing test cases to the design elements, design elements to software requirements, software requirements to product requirements. 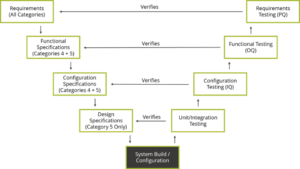 The types of specifications associated to a system are tied to its degree of complexity. For example, for a configured product (Category 4), then requirements, functional and configuration testing is conducted to verify the requirements. However, when working with commercial off-the-shelf software, (Category 3) then functional and configuration specifications are not required. Therefore, the extent of testing performed would also be reduced. The (best practice) aim of conducting verification is to demonstrate that the system functions as intended, by using the requirements and specifications as an objective standard to which the system is tested. The test protocols are traced to and from the requirements and specifications they verify. For Class II, III, (safety class C), the tracing needs to map the test case to the design element, design element to software requirement, software requirement to product requirement. If the test passes, the executed test protocol serves as documented evidence that the associated requirements and specifications were met. 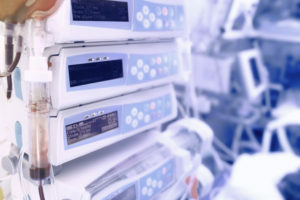 First, the risk-based approach advocated above is in line with the European EMA and US FDA regulations governing computer system validation, Annex 11 and 21 CFR Part 11, respectively. Additionally, because it’s a risk-based approach, it requires you to target and start with the high-risk areas of the system to scope out your testing approach in a logical manner, (avoid wasting extra time on low risk areas), and remain focused on revealing critical defects lurking in the code, prior to release. One great advantage (GAMP 4 vs GAMP 5) is the redefinition of Performance Qualification (PQ) as “Requirement Testing”, another was emphasis of the importance of Configuration Specification (CS), describing the system configuration and representing the reference (controlling specification) for the configuration verification activities (aka IQ). Also, because GAMP is a global organization (started in 1991 by a group of pharmaceutical experts in the UK who wanted to meet the changing FDA expectations for GMP compliance of manufacturing and related systems), GAMP 5 is designed to be compatible with IEEE standards, ISO 9000 and 12207, IT Infrastructure Library (ITIL), and other international standards. The GAMP organization wants you to keep in mind that GAMP 5 is not a prescriptive method or standard, instead it provides common sense, pragmatic guidance, approaches and tools for the practitioner. These key concepts will be explored in greater detail in future articles, but they are worth listing here. It’s all about the long view; update your processes today and enjoy amazing long-term benefits for your customers and your company tomorrow. Help! My iPhone won’t turn on or it’s frozen up! Next story Code Reviews, when done right – will make you a Hero!